Published: Dec. 7, 2012 at 04:56 p.m. Updated: Dec. 7, 2012 at 05:57 p.m.
U-T San Diego's Kevin Acee reported Thursday that San Diego Chargers general manager A.J. Smith and coach Norv Turner will be fired at the end of the season. Lombardi: What's next for Chargers? Turner has been down this road before -- we heard the same reports about his demise this time last year. This time, Acee reported Chargers president Dean Spanos "essentially decided at least a month ago" that Turner would be fired. Spanos dismissed the report in a team-issued statement, but there doesn't seem to be any escaping the ax this time around for Turner. Turner was asked about the report Friday as the Chargers prepared for this week's game against the Pittsburgh Steelers. 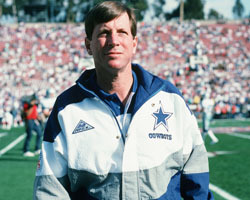 Take a look at photos of Norv Turner through the years. "It's part of the deal," he said. "The one thing I always feel good about, I got here at 5:30 in the morning and there were guys in the weight room, there were guys in the training room, there were guys already in meeting rooms watching tape. ... Any of the reports haven't affected them, and that's what I care about. They're getting ready to go and play their best and give themselves a chance to win in Pittsburgh." Turner said the report isn't affecting his approach to coaching. "I don't think so," he said, "so, you know, that's what I was trying to refer to. Our staff was here doing cards, preparing for practice when I got here at 5:30 in the morning. It's an outstanding staff, and I think they've done an outstanding job for this football team." A strong finish saved Turner last season, but no miracles are coming this time. Smith deserves to go, and it makes sense for Turner to follow him out the door.